A stretch of road in Columbus, OH coated with a liberal helping of cruel black ice is proving very effective at slinging trucks and SUVs wildly out of control. Watch as a local news team sat in one spot by the side of the road to record a slew of accidents. I'll give the news team the benefit of the doubt and assume they alerted local road crews or police or someone instead of just videoing the chaos with vulture-like glee. Who am I kidding, no I won't. 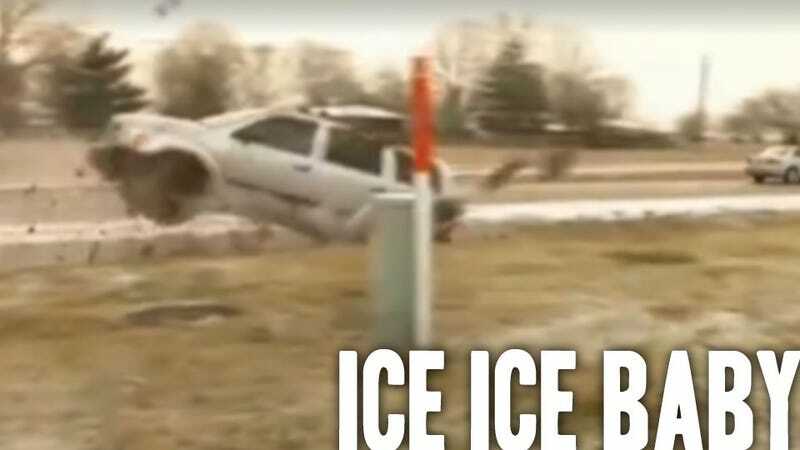 The video includes some pretty spectacular spin-outs, including what appears to be a Dodge Nitro catching an impressive amount of air before landing in a ditch. Of the vehicles shown in the report, all but one are trucks or SUVs, lending some anecdotal credence to the idea that large, four-wheel drive vehicles impart a false sense of security to many drivers. The speed that the vehicles were entering the icy areas suggests a lack of caution in many cases, and, of course, no matter how many driven wheels you have, ice, like the honey badger, just don't care. Perhaps the best part of it all is this quote from the accompanying article, which sums up the experience of skidding out with an almost Gertrude Stein-like feel: "I went over there, over there and I'm all over here."